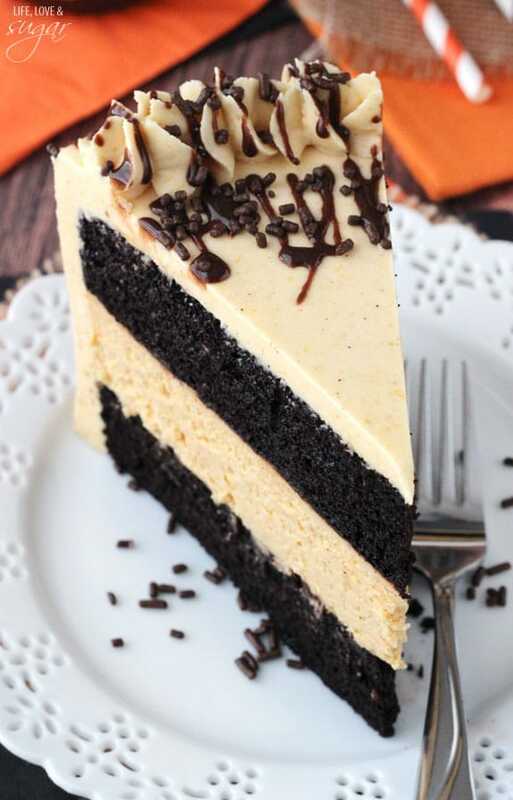 This Chocolate Pumpkin Cheesecake Cake is a perfect mix of moist chocolate cake and smooth and creamy pumpkin cheesecake. The combination of flavors and textures is delicious – even better than I expected! I think chocolate and pumpkin is my new favorite flavor combo. So after our trip, it has been good to be back in the gym the last couple of days. I hadn’t worked out for almost a week, and I have absolutely no control when on vacay, so it has been much needed. The only problem is that I’m a bit sore. Not from the gym, but from the trip. My niece was really into doing handstands while were there and it reminded me not only of my younger self, but of my cheerleading days. I cheered competitively for 8 years and it had me missing it. Oh well! Cake makes it all better. And this cake in particular. Oh. Em. Gee. There are so man things about it to love. First of all, it uses my favorite chocolate cake. It’s the moistest, most delicious chocolate cake ever. Moist for daaaaaays. If you’ve made some of my ice cream cakes or millionaire cakes, then it must be said that stacking this cake is even easier than those. 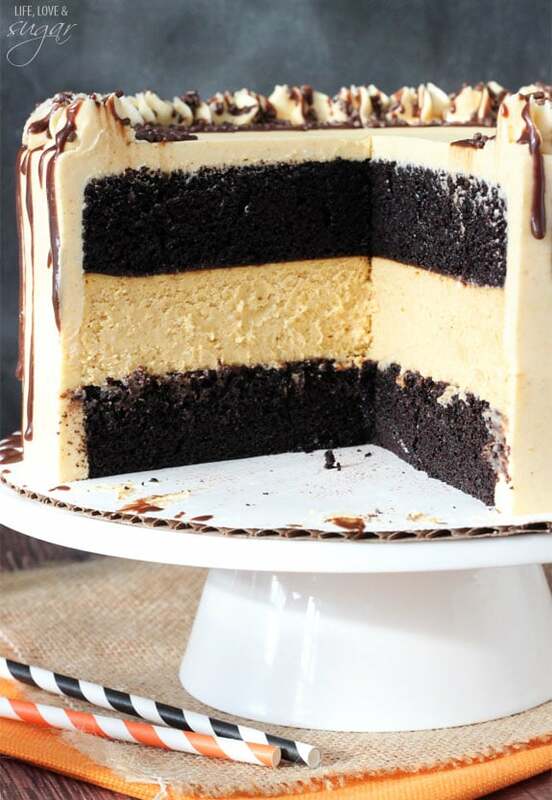 Because the cake and cheesecake layers are nice and solid, you stack them just like any other cake. No need to stack them in a springform pan or anything like that. Just stack then with the ganache between the layers to help hold them together. Easy peasy. Seriously, while the directions look like they might be tough at first glance, this cake really isn’t hard to make. There’s just more steps involved. Just trust me – it’s worth it. 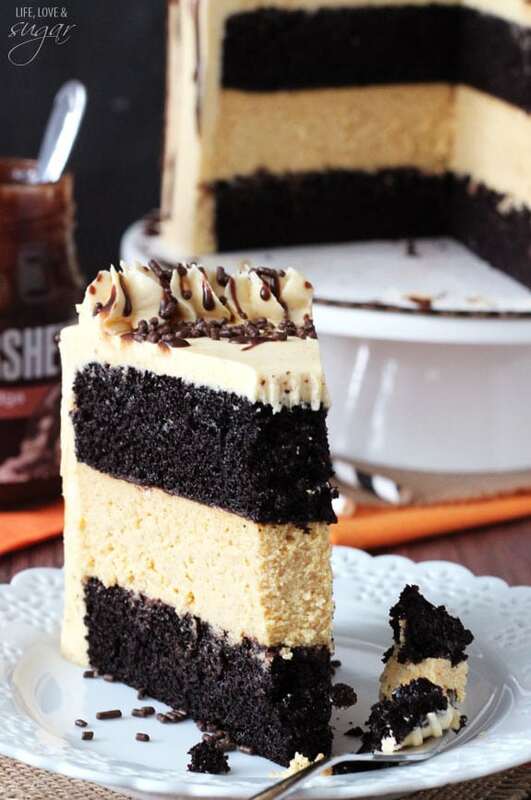 When you combine the delicious chocolate cake with the creamy pumpkin cheesecake and then add the pumpkin icing? Whoa. Just whoa. So good. 1. Prepare two 9 inch cake pans with parchment paper circles in the bottom, and grease the sides. 5. 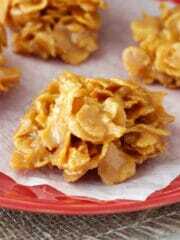 Pour into cakes pans and bake at 300 degrees for about 38-40 minutes, or until a toothpick comes out with a few crumbs. 1. Preheat oven to 300 degrees. Line the entire inside of a 9 inch cake pan with aluminum foil. Press it into the pan to get it as flat as you can. You’ll use the aluminum foil to lift the cheesecake out of the pan when it’s baked and cooled. 2. 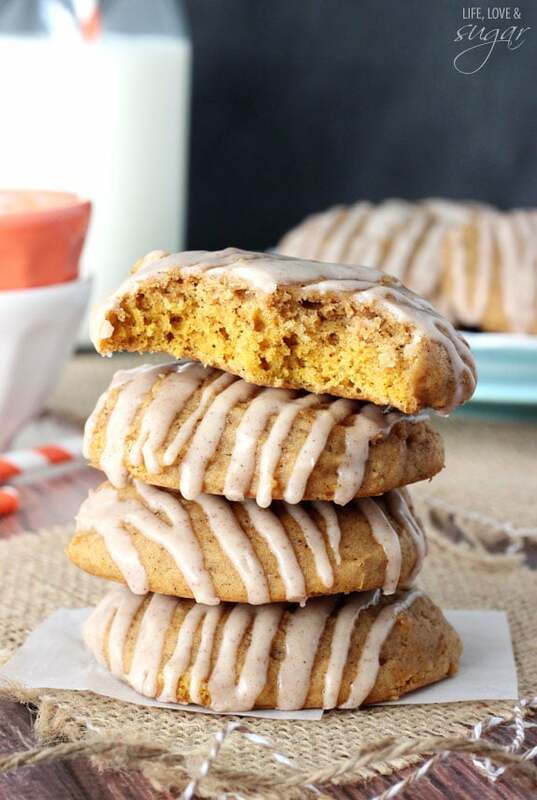 In a large bowl, blend the cream cheese, sugar, flour and pumpkin pie spice with an electric mixer (Use low speed to keep less air from getting into the batter, which can cause cracks). 3. Add the pumpkin, eggs and vanilla extract. Beat until well combined. 4. Pour the filling into the pan. Drop onto the counter a few times to release any air bubbles. 6. Remove from oven and chill until completely cool. 1. Beat together butter and shortening until smooth. 2. Slowly add 4 cups of powdered sugar and mix until smooth. 3. Add pumpkin puree and pumpkin pie spice and mix until smooth. 4. Add remaining 2 cups of powdered sugar and mix until smooth. 1. First make the chocolate ganache. Place chocolate chips in a metal bowl. 2. Microwave the heavy cream until it starts to boil. Remove from microwave and pour over chocolate chips. 5. 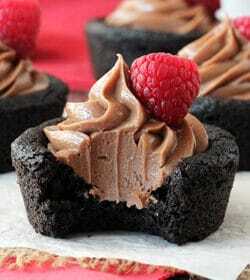 Remove domes from the tops of the two chocolate cakes. 6. Place first chocolate cake layer on a cake plate or stand. Spread half of chocolate ganache onto cake. 7. Remove the cheesecake from the pan and carefully peel off the aluminum foil. Place cheesecake on the first chocolate cake layer. It may be a bit bigger than your cake, depending on your cake pans. Use a large serrated knife to trim edges, if desired. 8. Spread remaining chocolate ganache on top of cheesecake. 9. Place second layer of chocolate cake on top of cheesecake. 10. 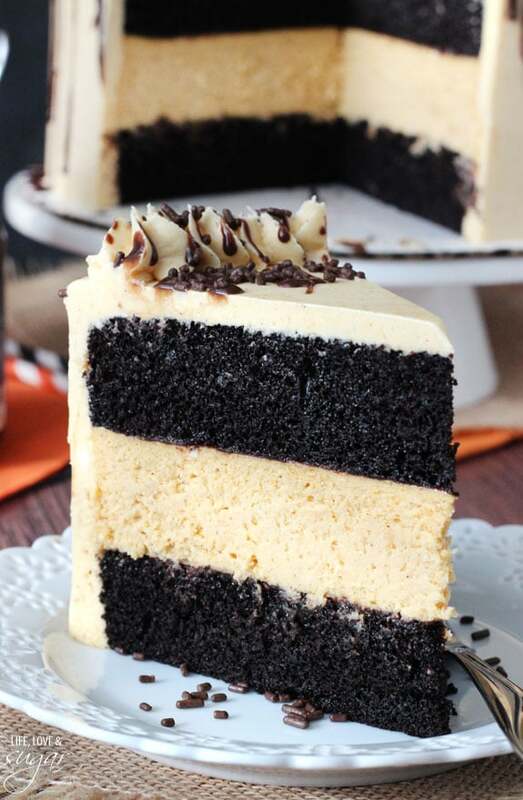 Ice cake with pumpkin icing. 11. Drizzle edges of cake with hot fudge and add sprinkles, if desired. Hey, the fact that you can still do all that cheer stuff is pretty impressive! And this cake is beyond impressive. I need to camp out on your doorstep with a giant plate. I’d never visit a bakery again! Oh my word that cake is glorious. So similar in look, yet so different in flavor from the salted caramel one I shared! Now I think I need this one in my life ASAP! Such a gorgeous cake I think I’m drooling. 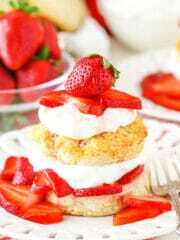 This one looks delicious, like always! Why oh why must you live so far from me? I seriously want to raid your kitchen every time I see a new post! Chocolate and pumpkin is my all time favorite combo! Love love love this fun cake!!! this cake looks fantastic – love it!! 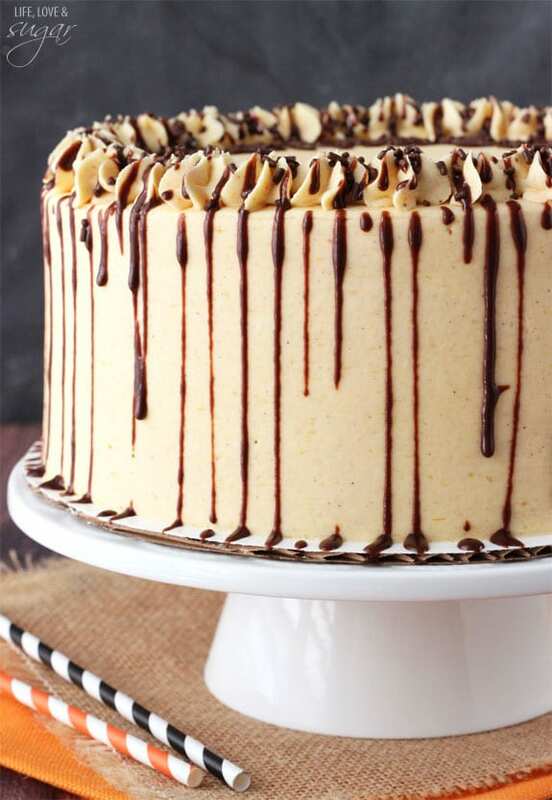 What a gorgeous cake and totally loving the pumpkin chocolate combo! I am literally speechless. 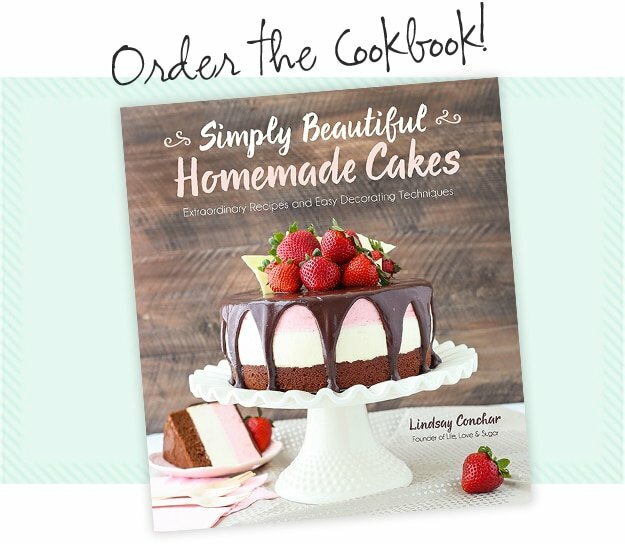 I was going to make just your chocolate cake this weekend (finally) when we go visit my family in Colorado, but I might have to make this instead. 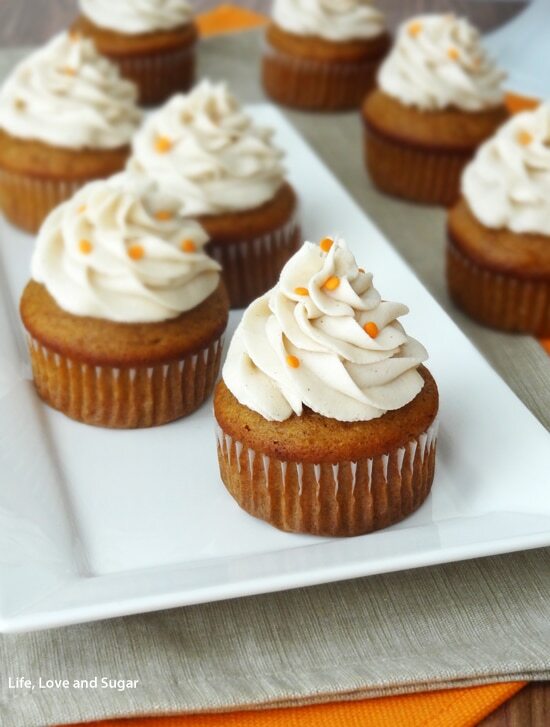 The pumpkin icing looks to die for. This is amazing! I love that you used ganache instead of frosting in between the layers. I’m going to have to try that some time. I’m slowly starting to like pumpkin more and more, but pumpkin and chocolate is definitely my favorite option! Chocolate and pumpkin pair so well together. This cake is over the top amazing. Ahhh cartwheels! Is there anything better? I was the first person to move into a condo on my floor and I used to sometime feel compelled to cartwheel down the hall…yes, I am 30. No, this was not 25 years ago! But this CAKE! Why is in not sitting on a plate in front of me! It’s taunting me, calling my name. Oh, the unfairness. I wish I’d been there. We’d have done the cartwheels together. FUN! Well.. I Made this cake tonight. Mine turned out NO WHERE near as pretty as yours, but this was also my first time making a “tiered” cake, and my first time making a Cheese cake, i’m just hoping it atleast taste good lol. I am not too big on pumpkin, can I substitute the pumpkin for something else? 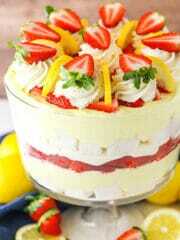 This cake looks amazing and I want some now. You can substitute it for sour cream and add vanilla to have a vanilla layer, if you’d prefer. I was wondering if I could substitute it with peanut butter in the same measurements as the pumpkin called for? I haven’t tried that, but I do think it would work. Ohh my goodness… You’re my hero for doing handstands with your niece like that!! Seriously the Best Aunt Ever award right there! I was never very good at those — balance and flexibility weren’t my thing — so I had to use a wall or a door to do them as a kid. But cartwheels were always fun, and my younger brother and I taught ourselves to do them from both the right and left foot. Such fun memories! 🙂 P.S. Can I please please pretty please be your neighbor?? You always post the most impressive decadent cakes, and I’m always dying to try just one tiny bite!! Pinned! Tell us, please, how you managed to make such beautifully clean cuts in this cake! Is is all due to an extra sharp knife, or is there more to it. What a gorgeous cake! I’m going to make it (and pin it). Thanks Kathleen! I tend to think it must be the knife, but I’m really not sure. I’m not sure if I’m missing something. But for the ganache, are we just using half the recipe and not doing anything with the rest of it? It says to use half amount of chocolate chips and half of heavy cream, heat and melt. And spread half of that ganache on the chocolate layer and the other half on top of Cheesecake. What happens to the rest of it? I’m sorry, I thought I’d taken that out of the instructions. You’ll make all of the ganache at once. Looks delicious! 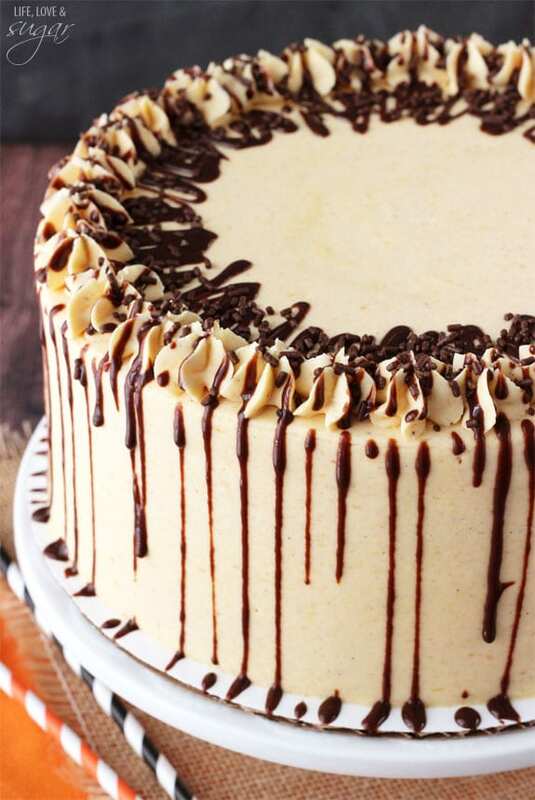 How do you get the frosting so smooth? Thank you! It definitely takes practice, but I also love this icing smoother. Hello!!! Let me just say I have been baking for many years and my family owns a restaurant that I bake for and design/make all of our speciality cakes. I have been to many sites and yours by far is my favorite. I made this cake yesterday and served it today at the grill. It was a huge hit as I knew it would be and I also had to try it!!! (I normally dont try the things i bake) or I would be extra huge! LOL it may be one of my very new favorites. who all eats all your yummy treats you bake so often? Thank you so much for sharing!!! love one happy custome cake designer! Made it. Ate it. Shared it (really shared it–with lots of neighbors). It’s beautiful and scrumptiously delicious. I’m impressed you could ever do a head stand! This looks super yummy! Have I ever told you how much your cakes amaze me!? I’m always so jealous of the perfection in them 🙂 This one looks like the perfect fall treat! Made the cake part of this recipe this weekend. o-m-gee amazing! tried to make my own cheese cake frosting, not so amazing. Lesson learned get all my dessert recipes from you! This is GORGEOUS! I’m hoping to make this in a few days to bring into work – just one question: For the frosting, what kind of shortening are you using? Thanks! Thanks Amy! I use vegetable shortening. I found this recipe online. My son asked for it to be made for his birthday cake this week. I cannot wait to eat it, it looks delicious sitting in our refrigerator. Thank you! Awesome! I hope you all enjoyed it! 🙂 Thanks Nancy! Not dumb at all – yes I believe they are the same. Pumpkin puree comes in a can, and that’s what I use. Is the chocolate cake the same as the other triple chocolate cake you have on this site? I just made this for my Granny’s 90th birthday party. It was awesome, thank you! I would recommend making an extra half batch of the frosting if you like a lot of frosting *and* fun decorative stars and things, I didn’t have quite enough for what I wanted to do. But had I been prepared, which I totally wasn’t, I could have fixed that. Instead I was flying by the seat of my pants as usual! Great cake- thanks again! I’m so glad you enjoyed it! Thanks Jessie! just made the cake part is it supposed to be on the heavy side? It’s not super light, but it is a fluffy cake. I made the cake today, and I must have done something wrong I think. It is such a heavy cake?! We are not used to oz and cups, so I specially bought maesuring cups for this. But when I measured e.g. the amount of powdered sugar in 1 cup, it was 160 g, so in total for the icing it was almost 1 kg powdered sugar (for 340 gr of butter&shortening)? And for the cheesecake 685 grams of cream cheese? I must have been doing something wrong, right? The taste is delicious, but it is as heavy on your stomach as the cake weights itself. So please help me out: what did I do wrong? I’m not very familiar with weight measurements, so I’m not sure about that. I will say that the chocolate cake isn’t a real heavy cake (I don’t think so anyways), but the cheesecake is pretty heavy, weight-wise. Certainly this cake will be heavy, weight-wise, when put together. But I don’t usually find that it’s heavy tasting. However everyone has a difference opinion on what that means, I’m sure. 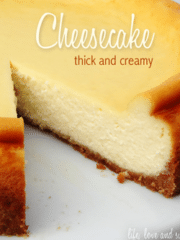 Was pretty good, but I think the instructions should be changed to shorten the cooking time for the cheesecake by at least 15 minutes, to make it creamier. The 1:30 total is too long and dries out the cheesecake. Was really disappointed in the outcome (although, might just be perfect with the cake and frosting alone!) The frosting is awesome. Going to make this cake this weekend for a Sunday night party. Can I make it on Saturday afternoon and it be just as good as freshly baked on Sunday? It looks wonderful! You can definitely make it a day ahead! Enjoy it! Thought I’d let you know that I am making the cake today (I’ve going to make and keep these as 2 separate desserts so it’ll fit in the fridge!). I made it the first time for Thanksgiving, and it was well received. Found the recipe via Pinterest and have shared your recipe with friends. I’m going to make this and I have a question. When the cheesecake is done, step 6 says to chill. Am I suppose to put it in the fridge or can I just leave it on a rack till cool? You’ll want to refrigerate it. Not only will it cool faster, but it’ll get firmer in the fridge which will make it easier to handle when stacking with the cake layers. You must be a pro baker bc this might be one of the most perfectly gorgeous cakes I’ve ever seen! I can’t eat refined/processed sugar…is there an alternative sweetener I can make this with? I want to make it sooo badly! Hi Cheri! I’m sorry, but I don’t have a lot of experience working with alternative sweeteners in baking so I’m not sure how to advise you. 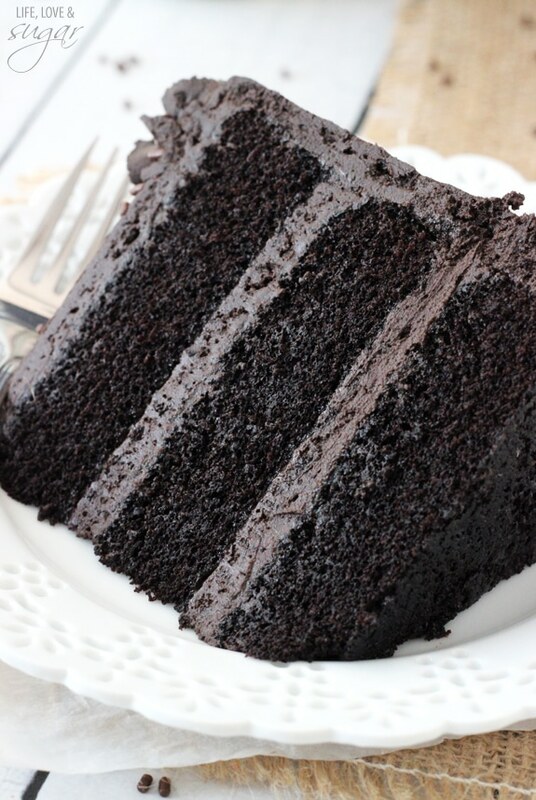 What type of flour is best to use for the chocolate cake? 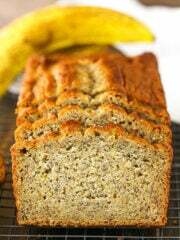 I have used both all purpose flour and cake flour and both work great. I typically use all purpose, since I have more of that on hand. I would think that should be fine, but I haven’t done it. As long as there isn’t too much more or less moisture, it should be fine. I hope it came out as expected and you enjoyed it! Thanks Rosselle! This looks so good, I am. Planning on making this for Thanksgiving this year. What is the difference between pumpkin pie purée and pumpkin pie filling? Hmm, I’m not sure that there is a difference. 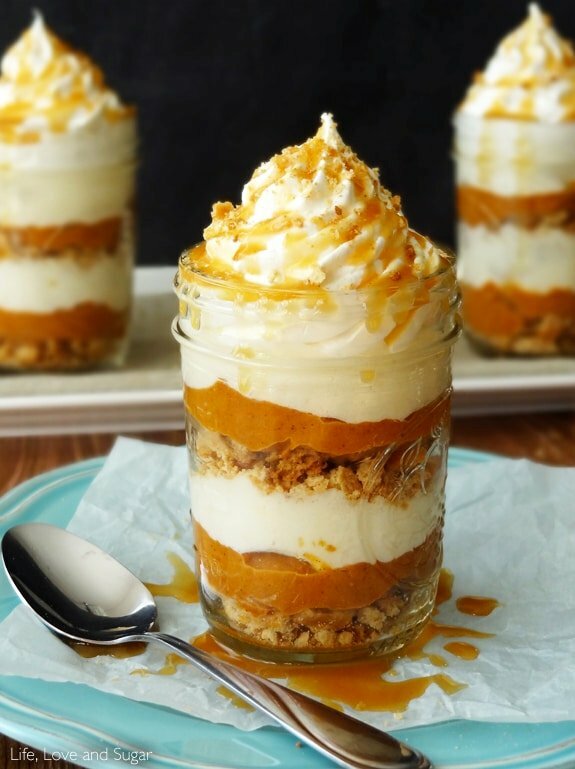 You want plain canned pumpkin – nothing that already has sweeteners or anything added. Can this be made with Hershey’s regular unsweetened cocoa? I am in the process of making this amazing cake as we speak for Thanksgiving tomorrow. I’m wondering if the cheesecake layer needs to be refrigerated? Would it be best to wrap up the cakes, put the cheesecake in the fridge and then assemble tomorrow morning or could I assemble the whole thing and leave it covered on the counter till tomorrow? The cheesecake definitely should be refrigerated. This cake actually will do well if you make it ahead and refrigerate it for tomorrow. Was in charge of bringing a dessert to my future mother in laws house for Thanksgiving! I love baking and this just looks amazing!! Can’t wait to try it out! Will most likely comment later about how amazing it tasted!! Thanks so much for this recipe. I made this for Thanksgiving dessert. It was declared as one of the best cakes I have made. I made this for 2015’s Thanksgiving after searching through gazillions of other autumnal desserts and am glad I ultimately landed on this one. It was super delicious, moist, interestingly flavorful and well received by my family. It does take some time to make the multiple components, but all of the parts are pretty straightforward. If I made it again (which I plan to), I would probably double the ganache and maybe experiment with a different frosting (mine was fine but not stellar). I made this for Thanksgiving last week. It was a huge hit! It was nice to venture away from traditional desserts and make something fun and dramatic. A few things……..
1. The pumpkin cheesecake was too thick for me. It did crack a bit in the middle, but I didn’t worry about that too much. But the texture was not light and fluffy and it could have used more pumpkin flavor. 2. The chocolate cake batter was VERY watery. This made me nervous. But I pushed ahead and was rewarded. The cake came out perfectly light and fluffy. It was not dry or dense at all. 3. I did not do the ganache layers in between because i thought it would result in TOO much chocolate. I will add it next time. The layers definitely needed something to help them stick together. Can i bake this in microwave with the same procedure? Hey Lindsay!! Wow!! This cake is next on my list to make!! 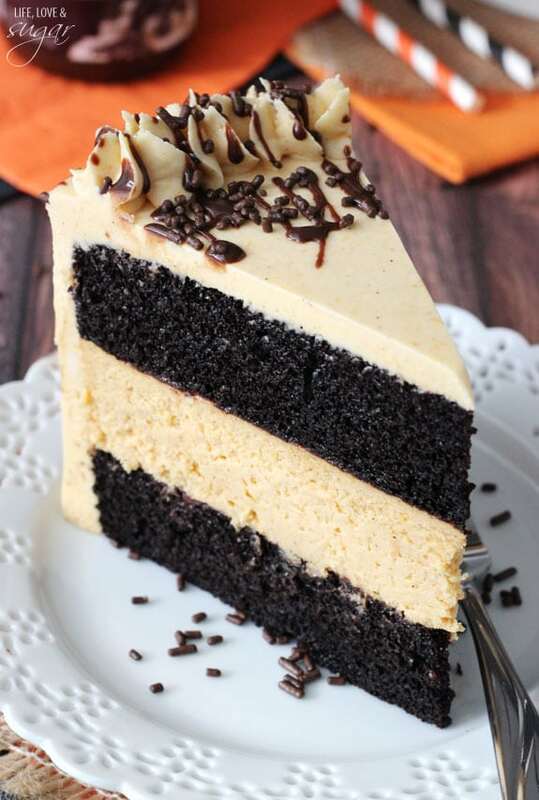 I do have a question for you about the pumpkin pie spice – do you use a powder pumpkin pie spice for the cheesecake and pumpkin pie spice extract (liquid) for the frosting? Or are they both liquid or powder? Thanks so much! Looking forward to making this!! It’s a spice mix, so a powder, for both. 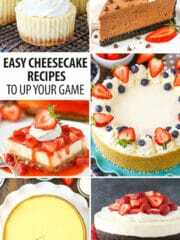 How far in advance can I make the cake and cheesecakes? Ganache and frosting?? I’d say a day or two in advance should be fine. 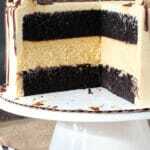 The cheesecake holds up well and the chocolate cake is crazy moist. The ganache and frosting would be fine for a week or so. Made this for Thanksgiving, and it was a huge hit. Recipe was easy to follow and delicious. Thanks! How did you put the cheesecake on the chocolate cake layer without making a big mess? It’s not like cheesecake slides easily off the springform….. please share your secret! Definitely be sure to grease the pan. You can also put parchment paper in the bottom of the pan, which will help it not stick. Once the cheesecake releases from the pan, it’s nice and firm and should be relatively easy to move around. This looks absolutely Devine. I’m trying to make a Black Forest cake like this – cherry cheesecake inside of two layers of cake. Any ideas on how to make an icing that’s the same consistency of yours? Just leave out the pumpkin puree and add another flavoring, like vanilla extract. You might also need to add some other liquid, like milk or water, to thin it out a bit. looking and easy to make! How do I remove the baked cheesecake from the bottom of the pan to a serving tray? If I have parchment paper on the bottom, it must be cut exactly the same size so as not to protrude around the edges of the cake, making it extremely difficult, if not impossible, to remove. Any suggestions? Thanks so much Linda! Here is a tutorial showing how I set my pan up for cheesecakes. I do use parchment paper to help prevent sticking and I’m able to remove them from the pan. Sometimes I have to loosen the parchment a bit by running my small offset spatula round the bottom. How do you remove cheesecake without breaking from pan when making Chocolate Pumpkin Cheesecake Cake? 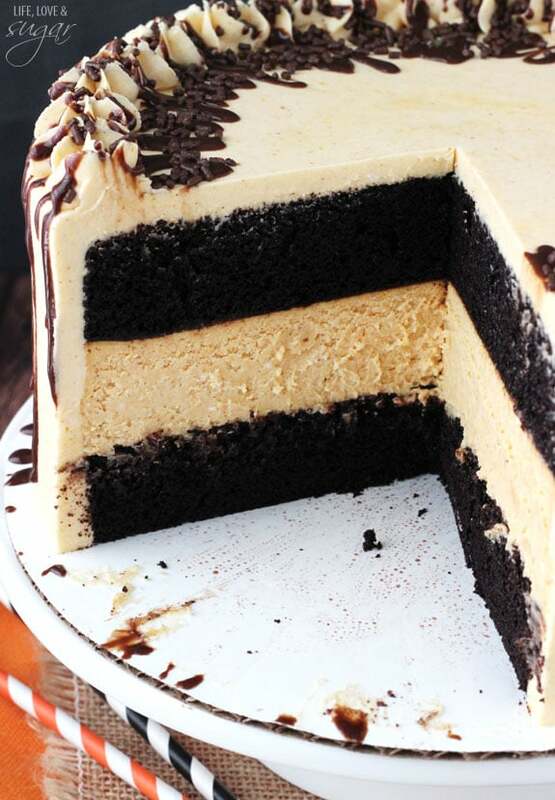 It needs to be placed on top of one layer of chocolate cake, so how to accomplish this without breaking the cheesecake? 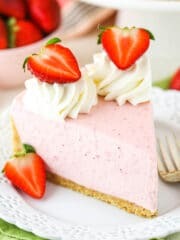 Would you bake the cheesecake with a piece of parchment paper underneath the cheesecake, then freeze it so it can be easily removed and placed atop the bottom chocolate layer of cake? Please let me know how you accomplished this feat!. I have updated the instructions a bit to help with that. It is a very thick cheesecake, so as long as it’s completely cold (not frozen) and you’re careful with it, it should be fine to handle it. I made the chocolate cake part only of that cake and it is now my go-to recipe. The mixture was really watery and since my cake was to be carved I added a cup of flour to the mix. Not only was it firm enough to carve, but it was still incredibly moist. 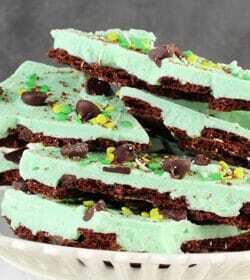 Plus it tastes awesome and is so easy and quick to make. I made this cake for my mom’s 88th birthday (9/26) and it turned out great! I even impressed myself! Thankfully I allowed myself plenty of time to make this chocolate/pumpkin cheesecake keeping in mind, like household projects, they always take longer than anticipated. The cake was moist and flavorful! Definitely use parchment paper in the cake pans. 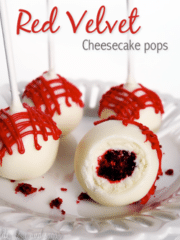 The cheesecake filling was good but not great. The flavor just didn’t “pop” with pumpkin spice flavor, but that may just be me. The guests loved it, and the cake was devoured in short order. Hello! 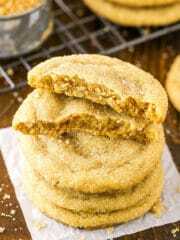 I wanted to make this tomorrow before Thanksgiving, and I wanted to know this: since this recipe uses Dutch-processed cocoa, could I replace the baking soda and buttermilk with baking powder? If so, how much would I need? No, I don’t believe you can.